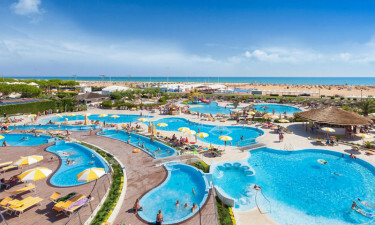 Boasting a clear, free-form pool and wide stretch of pristine sandy beach, the luxury camping site at Villaggio Turisico Internazionale is set in an idyllic location on the Gulf of Venice. The accommodation benefits from air conditioning in every mobile home and a well-appointed kitchenette. Outside, you’ll find a patio or balcony - the ideal spot for sitting back with a glass of wine to enjoy those warm Italian nights. To find out more about what LUX-Camp can do for you, and to book your escape to this dazzling holiday camping site, just get in touch today. 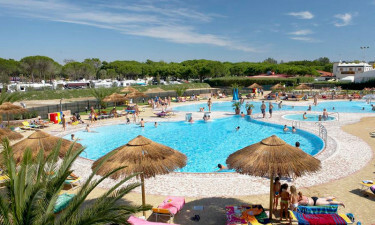 Why choose Villaggio Turisico Internazionale for my next luxury camping break? Pets are welcome at Villaggio Turisico Internazionale Pets too can enjoy camping luxury at Villaggio Turisico Internazionale – they are welcome in the park’s mobile homes and even have their own wash area! A main attraction on this beautiful site is the water park. As well as the central area for swimming and play, there are several other pools. These offer hydrotherapy massages, inbuilt seating and oxygenated air streams for the ultimate in relaxation. There is also a smaller pool where children can splash around safely. The beach is great for a cooling swim, but many organised sports take place here as well, from volleyball to beach soccer and bowls. You can also try your hand at sailing and windsurfing at the park’s school. Instructors will teach you the basics and build your confidence, before giving you the chance to test your newfound skills in the ocean! Villaggio Turisico Internazionale provides a full program of entertainment. From shows to music and parties, the team at Villaggio Turisico Internazionale are ready to bring daily entertainment to every age of visitor. If one of your group has a birthday while you’re away, just let the staff known and the event will be celebrated. 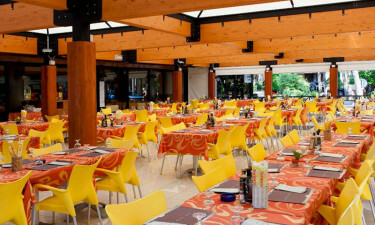 On a camping holiday to Villaggio Turisico Internazionale, you can choose between the park’s 2 restaurants, each serving up a choice of traditional dishes, such as pizza and fried fish. The Ristorante al Villaggio is ideal for people living with Celiac disease, as it provides many gluten-free dishes. The park has a large shopping centre with a number of small outlets and a well-stocked supermarket. 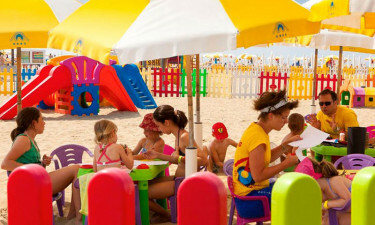 You can also find stores offering shoes, beach accessories, souvenirs and toys for the children.